Visited Hopworks while visiting Portland from Seattle. We had heard alot of good things about the brewery and it was on the top of our list to visit while in town. I am a vegetarian but my wife is a meat eater and based on the menu, it appeared we both had several different options for food. Parking was difficult and the parking lot was quite small. Not much parking on the surrounding streets but after a couple circles around the block, was able to find a spot. Walking in from the parking lot the front was very unassuming and simple. Once we walked in we were welcomed to a wide open and very bright feel from the full length windows that surrounded the building. It was midweek and around 4:30 pm...brewery was busy but we easily found a table. We probably sat for 10 minutes until someone came to take our drink order. But the waiter was really friendly and got our drinks to us quickly. I started with the Organic IPA and my wife the Totally Radler. A drink that was 70% of their Hub Lager (Czech Pilsner) and 30% lemonade. Both of us loved our drinks and the atmosphere was really enjoyable. Busy, vibrant, and just a great vibe. 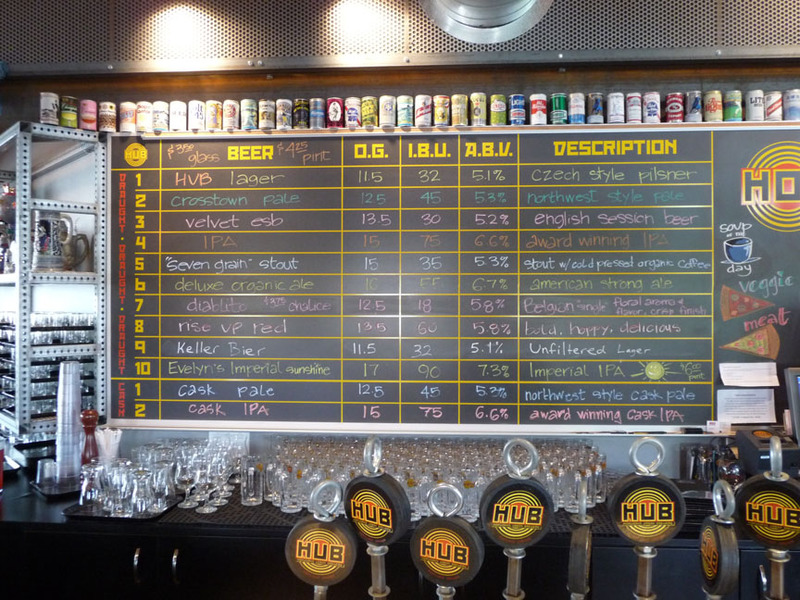 I'm really big on atmosphere and HUB was one of the better breweries I had visited for their ambiance and feel. For our food I ordered the Portland Bella (portabella mushroom burger)and my wife the Black Pepper & Garlic Beer Sausage. The food was excellent. Fresh, flavorable, and the fries were really good too. My second drink was their Pacific NW Ale on cask. I love cask beer and at times it can be difficult to find. The PNW Ale was phenomenal, slighter colder then room temperature (like a cask should be) but still had alot of kick and bite for a cask beer. Our overall experience was A+ with a small downgrade for service due to the 10 minute wait when we first sat down. Living in Seattle, we have numerous breweries in the area and we have visited most of them. Hopworks in Portland is our new favorite. 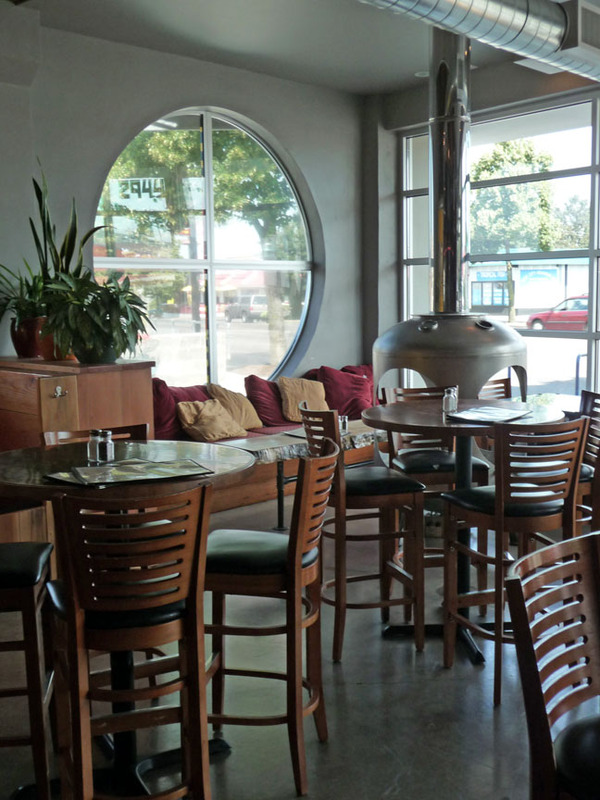 The atmosphere, great food, and great beer made this place a must visit if you live in Portland or are simply visiting. A nice bonus was that they give free stickers..I now have two HUB stickers on my kegerator! 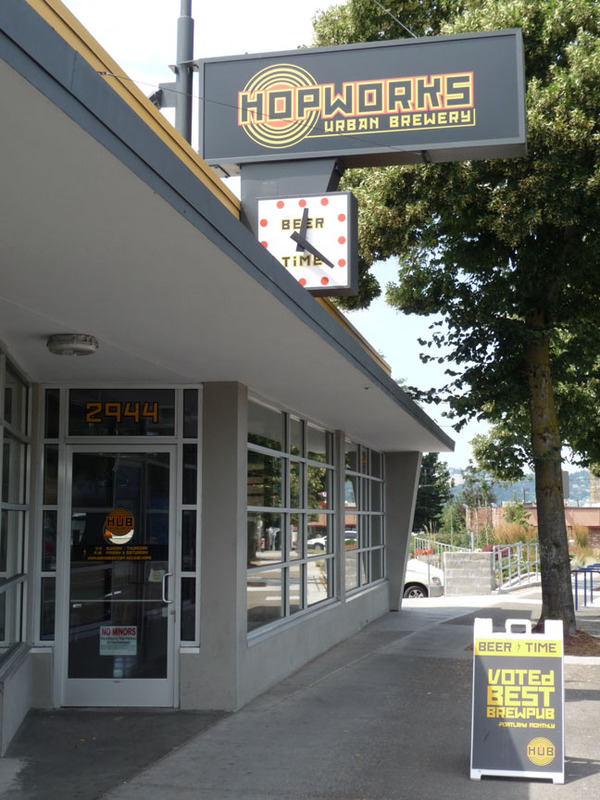 Hopworks Urban Brewery has quite an impressive range of styles from lager, to â€œBelgianâ€, to IPAs, and stouts. The IPA we tried was quite nice. There were ten beers as well as two on cask on our visit. The brewery is in the basement. This is a large place, well out from downtown Portland, right on Highway 26. Thereâ€™s a nice parking lot on one side. You enter on the side from the parking lot or from the front sidewalk. The bar area is in front, and the dining section and outdoor patio are in the back. The atmosphere/decoration is somewhat industrial yet itâ€™s comfortable and has a good pub vibe. The bar area is a nice space filled with honey-colored wood tables and tall chairs with black padded seats. There are also a couple unique seating areas in this section. The first is a padded bench in the corder with a thick slice of wood that serves as a table and is right by a stand-alone fireplace made of a beer serving tank with circular holes cut out of the sides. The other is a table inside of a former safe/bank vault (donâ€™t get locked in!). Several of the booths have an old electrical box on the wall in which the condiments are kept. The bar itself is quite long and curves into the room. The bar has a copper top and is faced with a metal screen made from metal sheets with numerous holes punched in them. Above the bar is a â€œstructureâ€ made of bike frames that holds the lights and curves along the same shape as the bar. The ceiling is quite high and thereâ€™s a mezzanine level with game machines and more tables and chairs. The walls are painted rust and bright yellow. The dining section has both tables and booths. At the very back is a nice outdoor deck that overlooks a parking lot but is high enough above that it doesnâ€™t dominate the pleasant outdoor feeling. A couple minor notes - the toilet paper holders are made of industrial pipes, and in the womenâ€™s room the words â€œyou are beautifulâ€ are written in cursive letters across the bright yellow wall but such that you can only read it in the mirror (i.e., is written backwards). Food choices look fairly standard but good - pizza, soup, salad, sandwiches, burgers, and a nice lunch special. Flew out to see what brother was up to for a long weekend. Took an early flight to Portland and at 10:59a, turned up at the Hopworks Urban Brewery to "help" the staff open for the day. Great place! New, nice, interesting decor. The brew was traditional NW fare; hopped and fresh. I enjoyed the Hopworks for the organic beer and "green"/"sustainable" building. Though, being a little 'old school', Hopworks format was a bit trendy for me. I've been a fan of Christian since his days at Laurelwood and found his new enterprise nothing short of great! HUB is concerned with the environment and have taken many steps to limit their carbon footprint. A being environmental has not effected the number or quality of their beer. This is a must stop in Portland for the brews and the food. Family friendly and just plain fun. I hope Christian stays on the Portland beer stage for many years to come, and I can't wait for my next trip to Portland. Open bustling pub. Interesting bikes over the bar. 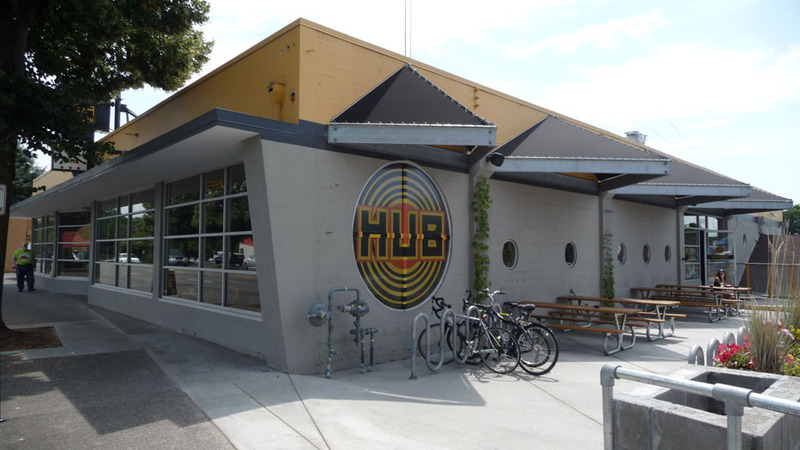 They are Portland's first "Eco Brewpub"? whatever that means. They have a modest selection of 6-7 brews. I drank a pint of the Imperial IPA. I was a bit taken back by the highly filtered look of the brew. The aroma was good and the flavor intense. Paired the brew with a great slice of pizza. I was not expecting such great pizza at a brewpub. The bartender was very knowleable and freindly. Overall a good place to hit if you are in that area of Portland. The atmosphere, beer, food and people working where all awesome I loved this place. 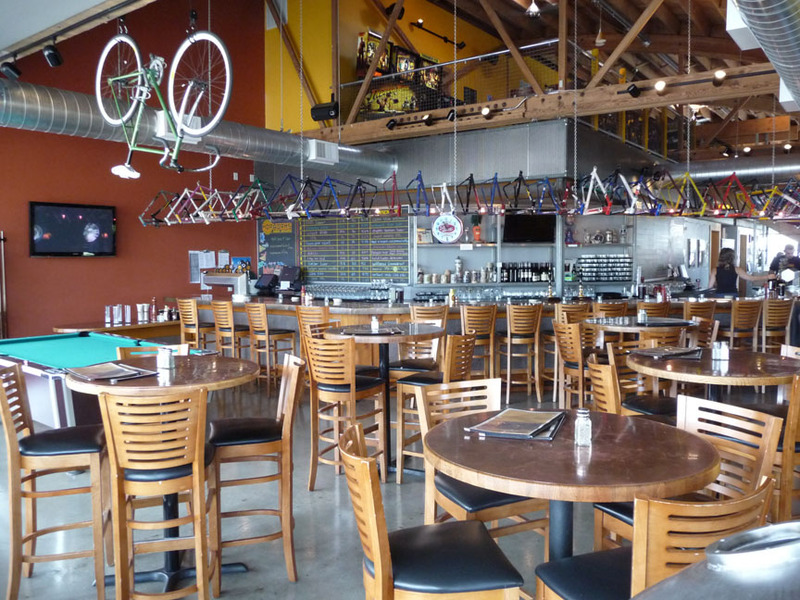 They have a wonderful bar and the bikes hanging from the bar are an awesome addition. The beer was great they brew all organic beers and they where great. The food was pub faire and very tasty. Tons of parking and easy to find. A great place to take the kids for a nice lunch and a pint. This is a wonderful addition to the Portland beer scene. They have specials and special tastingsâ€™ so get on their website and sign up for the updates. I will be back for sure this place was great. This is a great addition to Portlands brewpub industry. The building remodel made extensive use of green and remodeled materials. It is very comfortable. It is a large building, so it offers several types of atmospheres. The beer is all made on site, and is totally organic. I've tried several varieties, and they all stood out as being exceptional. It is not the largest selection, but it covers the full range you would expect. The food also proved to be very fresh and the proportions were a pleasant surprise. The pizza is among the best I've had at a restaurant. Everything from meat lovers to Vegan. The staff was very fun and proffesional and the service was more than acceptable. A must try for anyone who professes to be a beer officianado. Although it has been open for some time now, it still tends to be busy, so go when you have time to truly enjoy the ambiance.